Eating out at a restaurant was probably the hardest part of overcoming heart disease. When W and I started educating ourselves about the causes of heart disease, we found of course, all of the information about how unhealthy a diet is that is high in sugar, salt, and fat. So, although we were able to quickly make changes in our meal prep at home, we found that eating out was a real challenge. 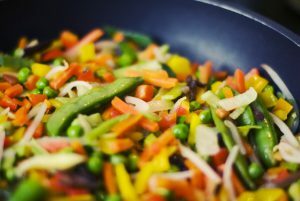 Even just five years ago, the term vegan wasn’t very well known in all parts of the country, and most restaurants didn’t want to make substitutions to their menus. But we found that once we started telling the server that our requests were for health reasons, we didn’t get any arguments. We actually had one server ask if we were allergic to fat? W, of course, said yes! There is a very different attitude about eating a healthy diet than there was just 5 years ago. Most restaurants have some type of vegetarian, or at least a low fat option, on the menu. Many places offer a veggie or bean burger. It may not be listed on the menu, so be sure to ask. We’re even finding delicious meat-less green chile at our favorite Mexican food restaurant. And most restaurants serve some type of grilled or baked fish, which is a nice high-protein, low fat, low sugar alternative to red meat or chicken. So, when eating out, don’t be shy about asking to substitute those french fries or potato salad with something more healthy. I try to opt for the steamed veggies, and ask to have them made without butter. You can always request some fresh lemon wedges, and squeeze some lemon juice and add a dusting of black pepper on your veggies. And a little hot sauce can help, if you like the extra spice. Almost all restaurants have a green salad. To help with your protein, which will fill you up without the heaviness of fat, try adding grilled salmon, or another type of fish on top of your salad. Just stay away from fried fish; opt instead for baked or grilled. Have them add some beans, such as chickpeas (garbanzo beans), kidney beans, or black beans if available. Go easy on the salad dressing or sauces; try to substitute them completely with lemon juice, balsamic or red wine vinegar. If you must use salad dressing, have it served on the side, and dip only your fork tines into the dressing and then pickup a fork-full of salad. That will greatly reduce the amount of dressing you consume. And when it comes to dessert, try to resist the temptation. It’s usually just empty calories of sugar, salt, and fat. 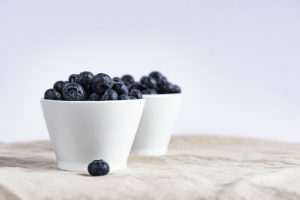 But a great alternative is a small cup of fruit, such as blueberries or raspberries, or both. And if you like it, add a small square of dark chocolate. Not the sweet milk chocolate kind. Go with a dark chocolate of at least 83% cocoa or higher. It’ll taste bitter at first, but as you get used to it, it will really hit the spot, especially with the blueberries! Yum. So, If you have any questions about how to choose healthy meal alternatives, just type them in below and we can have a chat about it! And let me know what you’ve found to be your favorite substitutions at your favorite restaurant. I’ll be adding some restaurant reviews from some good eats restaurants that we’ve found in our part of the country (Colorado), and if you mosey on over to the Fearless-Eating Recipes page, I’ll be posting some healthy recipes that W created. He really should have been a chef. My wife and I love to eat out but it’s expensive and we have to watch what we eat as we are diabetic. We are careful with what we order and try to stay with salads and dressings on the side. These days most restaurants offer healthy choices. And I notice that the menus do have the calories listed and that makes it easier too. But as you mention, we have to resist the desserts and especially because of the sugar content. Thank you! 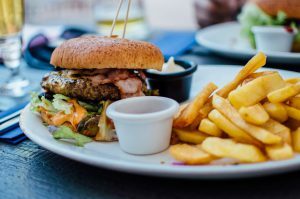 Hello and thanks for sharing this most helpful post on eating out, one thing that I think that a lot of us need and that is to have discipline when it comes to what we put in our mouths. But the reality is that so many persons do not have discipline and because of this that is why so many persons are having health issues. Your website is well detailed and filled with tons of great infromation. Thanks again for sharing. You are so right, Norman! Discipline is the elusive key! What W proved to me is that if your life is on the line, you will be willing to do anything, including making heart-healthy eating choices. You make some great points about eating healthier out at restaurants which is clearly an obstacle that most trying to eat well struggle with. One thing that has really worked for me that I you also mentioned is watching sauces. Those hidden calories can be a killer! 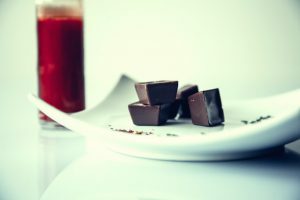 I also do the dark chocolate for dessert, not only is it delicious it’s good for you!